There comes a time in life when you realize you no longer need those old trinkets you used to keep in your china cabinet, or the logo shirts you wore in high school you told yourself you’d never get rid of at the time. But maybe it’s time to simply hold on to those memories in your head instead, and gently get rid of objects that are resting in old, dusty boxes you hardly open more than once a year. 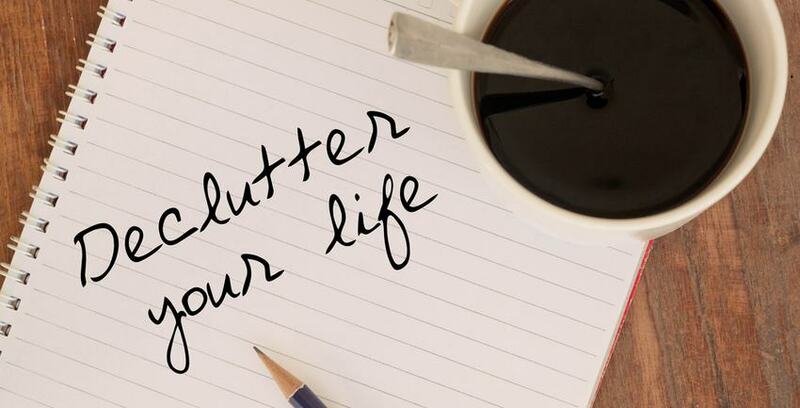 The decision to downsize your belongings is more than making definitive keep or toss piles — it’s an emotional process that requires willpower. Even if you’re not the sentimental type, this is going to require work. No, there isn’t a right time to do this. You don’t need to wait until you’re experiencing a major life change, or you’re in the midst of moving to a new place or city. In reality, adding the decision to downsize into the mix when those events happen can make your situation a whole lot more stressful. Do it now, instead. Spend a random Tuesday evening planning which rooms you’ll start with and your realistic goals of how much stuff you’d like to keep in your house. If you are in the midst of a major life transition, don’t hesitate to tackle this second project of downsizing. It’s really up to you to determine how much you’ll need or want to get rid of. If you’re preparing to start a family, perhaps you need to clear a few shelves and free up some storage space for those children and their future art projects they’re going to eventually bring home from school. If your kids have left the home and you’re now empty nesters, maybe it’s time to sift through all those old papers and have conversations with their owners — they might not hold sentimental meaning anymore and could be tossed to make room for new memories. This article from Bankrate is a great resource for seniors debating whether downsizing is the right choice for them. The first question you should ask yourself is what you would replace if you lost all of your things. Would you go out and buy that new jacket? How about that bookshelf that fits perfectly in that nook in the corner of your bedroom? Perhaps you would, perhaps you wouldn’t. Those pictures, though — you’d want to replace those, despite the fact that they’re irreplaceable. You can’t get those race medals or diplomas back. There’s a time and place to throw them, if you’re not attached. Yet it’s important to remember what you can and can’t replace, and how important you feel it is to keep those items around. When you do decide to get to work, consider this: start in the rooms furthest from your central spaces. Those rooms often house the most junk and things you toss aside that you want to keep but don’t necessarily use. Slowly work your way into the living room and kitchen, and don’t rush the process. When you’re loaded the donation boxes and closed the lids to the bins you probably won’t open again for awhile, the work isn’t finished. In fact, it’s easy to fall right back into a trap and end up back where you started. Moving forward, you need to be ruthless about what enters your home. If you’re not, the closets will slowly fill up again, and the storage room will accumulate things you don’t need to keep in the first place. You made this change, and it’s up to you to maintain its effectiveness. Even if you don’t think carefully about everything that enters, take some time once a month and purge your home of anything you don’t need. Still have excess stuff you can’t bare to part with? Storage Direct can help. We offer secure, nationwide facilities that are sure to fit your needs. Contact us today to learn more!